Hyde and Tracey Kramer, Seneca, S.D., with Greg Jorgensen at the Jorgensen Land & Cattle sale. The Kramers purchased several Jorgensen bulls. 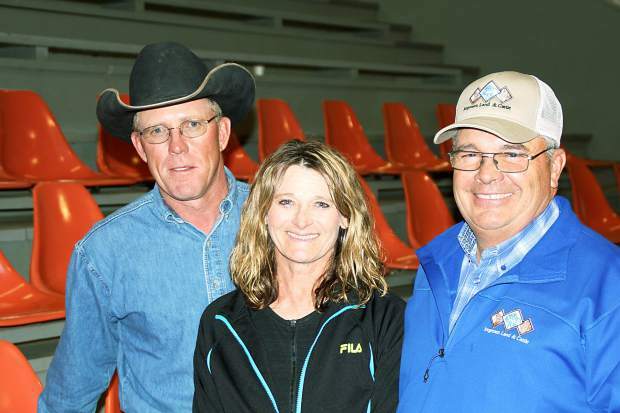 F Cross Livestock - Steve, Carol and daughter Laura Balius - purchases several Jorgensen bulls. 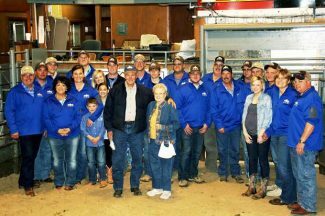 It was a great day for a bull sale when Jorgensen Land & Cattle held their 43rd Annual Production sale at Winner Livestock Auction in Winner, South Dakota. There was a great crowd of new and repeat buyers on hand for the sale, giving the Jorgensen family their best sale ever. Jorgensen Land & Cattle was recently recognized as the largest bull marketer in America. They have an extensive bull lease and private treaty program that encompasses a huge trade area. The bulls in this sale are specifically reserved for this sale. They have risen to the top of the herd in many breed-leading traits and are exceptional in quality and structural soundness along with calving ease, carcass quality and overall performance. The goal at Jorgensen Land & Cattle is to produce the best line-bred cattle in the nation, and this family is at the top of the list for doing just that. The top selling bull on the day was lot 4223, Ideal 4223 of 1168 Blackbird, a Jan. 2014 son of Ideal 1168 of 9814 Lady. This calving ease herd sire prospect had a weaning ratio of 114, yearling ratio of 114 and gain ratio of 114, epds of CED 14 BW -5.8 WW 54 YW 105 Milk 32 $B 104.41. MR Angus, Wheatland, Wyoming, and Wheeler Mt. Ranch, Whitehall, Montana, teamed up to purchase the bull at $23,000. Also selling at $23,000 was lot 4136, Ideal 4136 of Res Blackbird, a Feb. 2014 son of SAVE Resource 1441 that had a gain ratio of 118 and epds of CED 4 BW 1.6 WW 62 YW 113 Milk 34 $B 108.16. Longtime repeat buyer, Ballagh Cattle Co., Burwell, Nebraska was the buyer. Lot 4141, Ideal 4141 of Res Blackbird, a Feb. 2014 son of SAV Resource with epds of CED 7 BW 2.0 WW 65 YW 109 Milk 37 $B 97.77 sold to another repeat buyer, F Cross Livestock, Gordon, Nebraska for $19,000. Selling at $18,000 was Ideal 4655 of 1281 Jilt, a Feb. 2014 son of Ideal 1281 of 6469 Jilt that has epds of CED -10 BW 3.4 WW 61 YW 98 Milk 31, Dan Duffy, Winner, South Dakota was the buyer. Also selling at $18,000 to Risse Angus, Martin, South Dakota was Ideal 4611 of 1218 Betty, a Feb. 2014 son of Ideal 1281 of 6469 Jilt with epds of CED -1 BW 2.2 WW 59 YW 103 Milk 29 %B 101.88. Four bulls sold at $17,000 each. Ideal 4396 of 8345 Lady, a Feb. 2014 son of Ideal 8345 of OR 6505 and Ideal of 1281 Blackcap a Feb. 2014 son of Ideal 1281 of 6469 Jilt both went to F Cross Livestock, Gordon, Nebraska. Ideal 4127 of Res Marjorie, a Feb. 2014 son of SAV Resource sold to DeKay Ranch, Niobrara, Nebraska.